At the end of November my family gave to me…a few days of internet searching for Black Friday deals for thee! At the beginning of December my family gave to me….A few evenings of card writing glee! On the 2nd week of December my family gave to me…A minor panic as I realised the Christmas Supermarket delivery slots were no longer free! Also on the 2nd week of December my family gave to me….A Mums nights out or maybe three! 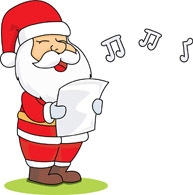 Also on the 2nd week of December my family gave to me….a nativity concert, a reindeer run and a carol concert to see! Also on the 2nd week of December my family gave to me….decoration (firstly by the kids, then Mummy) of the Christmas tree! On the 3rd week of December my family gave to me….Wrapping (what feels like) hundreds of presents for all of my family to receive! Also on the 3rd week of December my family gave to me….A stinking cold for thee! On the 25th December my family gave to me….children smiling, laughing and squealing with delight – what every Mum wants to see! Now please somebody bring me a large cup of tea!! Christmas causes excitement in every house. In our house, it means Bam’s ADHD is heightened. He has even more energy and is extra, extra bouncy! So I know I need to be prepared. Do I really need to prepare for it in October though? Sadly, it would appear that I do! Following a family stroll at the weekend we took the boys for a drink and cake at our local garden centre. We took a stroll around the centre afterwards. Hubby and Mops ventured off to the toilet leaving Bam and I looking at the fish. It was then that he started bouncing around like an excited puppy. ‘Mum, Mum, there’s Christmas stuff in there! I can see a light twinkling’ I was totally unprepared for this, we have only just entered Autumn – Christmas had only been a fleeting thought in my mind, nothing more. Noooo, it can’t be, it’s the 1st October! Noooooo! Sure enough, I glanced into the shop to see the smallest twinkling light shining through the corner of a window. The boy’s Christmas radar was on fire!! ‘Come on Mum, let’s go and have a look?’ Before I had a chance to reply, he was gone in a flash, full of energy and squeals! As I ran through the sliding doors in an attempt to catch up with him I could see he was right….indeed the shop was full of Santa, Rudolph, snowmen etc, all staring at me with a smug cheery smile. Bam was running through the shop, cuddling big polar bears, picking up Santas and diving into an igloo full of yet more Santas and more snowmen. All the time with a beaming smile from ear to ear! Uh oh, Christmas 2016 here we come…in October! Any tips on managing the excitement over the Christmas period? All tips gratefully received! Life is full of boundless opportunities…. That’s the way it should be, that’s what childhood is all about. I remember coming to the realisation in my teens that the world may not be as kind as I had originally thought. As your general awareness grows your perception of the world and the people in it changes. That’s why we often long to relive our childhood. We all want to be free from worry, to be care free. When you have ADHD the world is even more exciting than it may be for a child of a similar age – in his eyes he’s invincible, he lives in the moment. So this weekend we have had lots of excitement in our house! It’s Halloween, a chance to dress up as something scary and fill up on sugar….and that’s just me 🙂 The thought of Halloween has Bam bouncing around the house and everywhere else, eyes filled with excitement, running everywhere with limitless amounts of energy. Don’t get me wrong it’s exhausting for us but with the same token I love watching him, wishing I had some of his energy, wishing our life was filled with excitement from morning to night. What a way to live, maybe I should take a leaf out of his book and embrace all the good things in life with renewed energy.